Answer the What, Why and How of Corporate Governance! What are you looking for from a corporate governance course? If the answer is a practical guide containing the essential principles of corporate governance and how to implement them – at an affordable price – then this is the course for you. Our 6-day corporate governance course contains a wealth of information on the essential issues and implementation guidance in a series of ebooks delivered directly to your email inbox every day in convenient PDF format*. 5 Golden Rules of Corporate Governance! Adhering to these rules using our methodology will make compliance with the various international governance codes much easier. The complete collection of ebooks delivered in this 6 day course forms a convenient corporate governance handbook which we call the Applied Corporate Governance Board eManual. Eight pages of strategic and financial management definitions to help you understand the more technical aspects of corporate governance. A useful resource not just for corporate governance but for understanding wider business and finance terminology. Having clear goals is such an essential part of corporate governance that it forms one of our Golden Rules. On Day 3 of the course we present a model for a goal discussion meeting. We include a freely editable version of this agenda in OpenOffice and MS Word format for you to use and adapt to your organisation and needs. This represents the best value corporate governance course anywhere on the internet. Based on many years experience in training, consultancy and authoring, it will give you the tools to make a difference not just to your organisation, not just your stakeholders but, potentially, your country and the wider world. Such is our passion for making a difference we are pricing it at a level which most organisations and indeed individuals can afford. Thank you for your interest in taking your understanding of corporate governance to the next level. Together we can make a difference. Please let us know if there are any further ways we can help you! We freely answer all questions sent to us from all over the world via our contact form from students, micro-finance and similar organisations as well as businesses so please feel free to get in touch with any queries, academic or practical you may have! Still not sure? 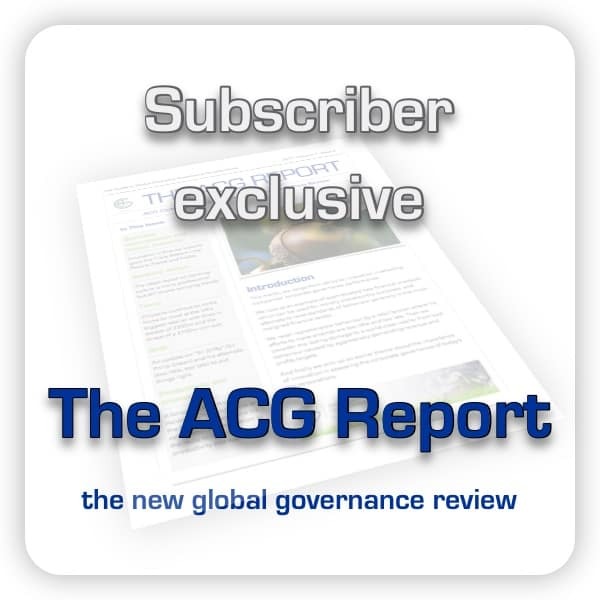 Why not take a look at our FREE ebook – Introduction to Corporate Governance and the ACG Methodology. Subscribe to our mailing list to receive your copy! You’ll also be kept up-to-date with the latest content, news and survey results.